The U.S. Navy Blue Angels are scheduled to fly over Pensacola and Pensacola Beach this afternoon, marking the team’s return to town for the 2017 air show season. The elite fighter jet pilots and their support staff have been in El Centro, California, for winter training since Jan. 5. The six F/A-18 hornets should fly over the area sometime after 12 p.m., according to city officials who have encouraged people to line Palafox Street to greet the team. The Pensacola Naval Air Station-based team is entering its 71st season. The popular practice demonstrations and autograph signing sessions at Pensacola Naval Air Station’s National Naval Aviation Museum are scheduled to resume on March 28, according to the museum’s website. Blue Angel pilots come from the Navy and Marine Corps fleet and typically serve two-year tours with the team before returning to other duties. Pilots selected for the team must adapt to flying without the traditional G-suits worn by other fighter jet pilots and flying with a 40-pound spring attached to the flight stick of their F/A-18 Hornet. The G-suits, used to keep blood in the upper body and prevent pilots from passing out, have inflatable bladders in the legs that can interfere with a pilots’ ability to control the flight stick. The Blue Angels instead use abdominal exercises and breathing techniques to fight the G forces. The 40-pound spring on the flight stick allows for more-precise control of the jet. The six jets typically fly in formations with their wingtips just inches apart. #1 Navy Cmdr. Ryan Bernacchi, flight leader. Bernacchi is a native of Los Altos, California. He attended the University of California, San Diego. Bernacchi graduated from the U.S. Navy Fighter Weapons School (TOPGUN) at Naval Air Station in Fallon, Nevada, in 2003 and later became an instructor pilot at the school. Before being selected for the Blue Angels in September of 2015, Bernacchi was the executive officer of a Strike Fighter Squadron on the aircraft carrier USS John C. Stennis. #2 Navy Lt. Damon Kroes, right wing. Kroes is a native of Fremont, California. Kroes served in the U.S. Marine Corps before graduating from San Diego State University in 2006. He was later commissioned as an officer in the Navy. 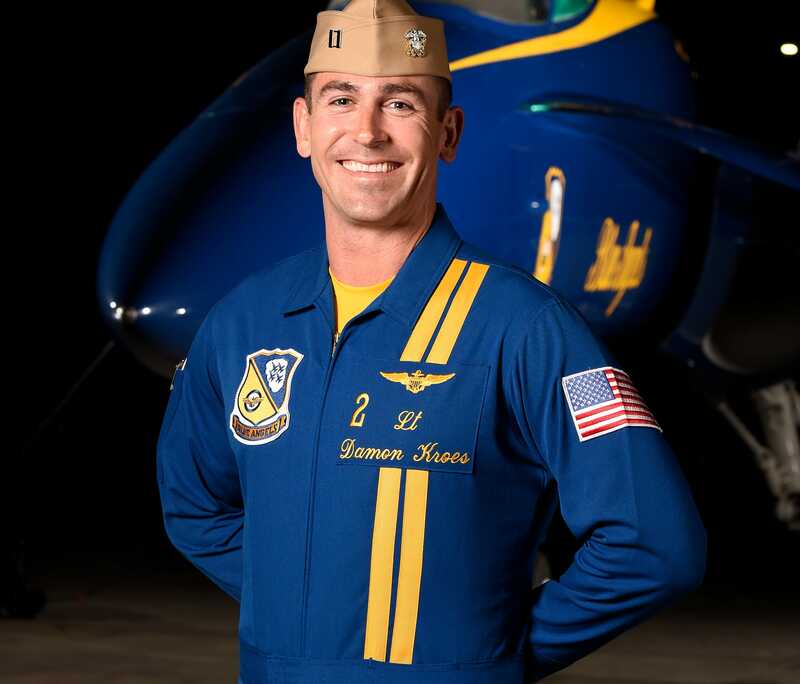 Before being selected for the Blue Angels in September of 2016, Kroes served as a flight instructor at Marine Corps Air Station Miramar, California. #3 Navy Lt. Nate Scott, left wing. Scott is a native of Danville, California. He attended the University of Southern California. 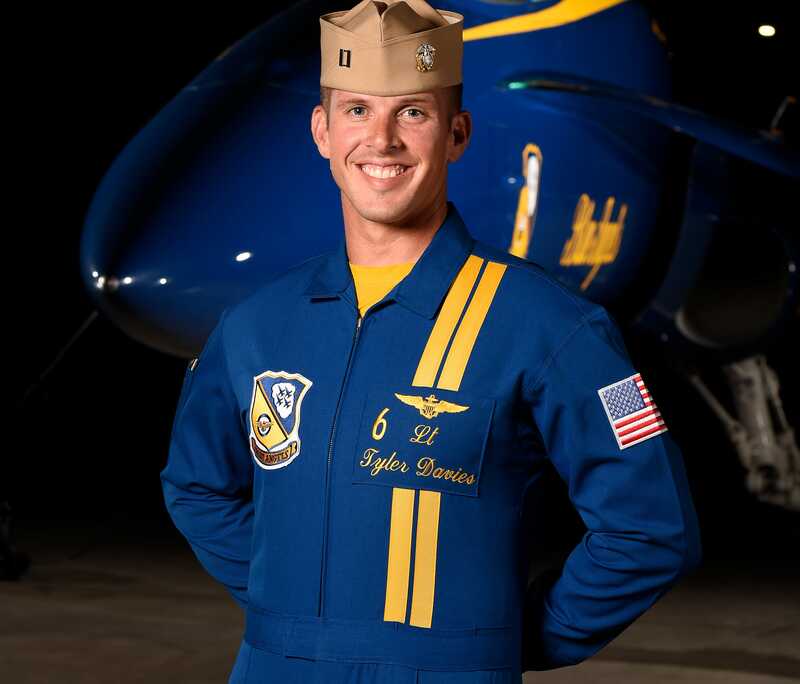 Before being selected for the Blue Angels in September of 2016, he was an instructor pilot at Naval Air Station Oceana, Virginia. 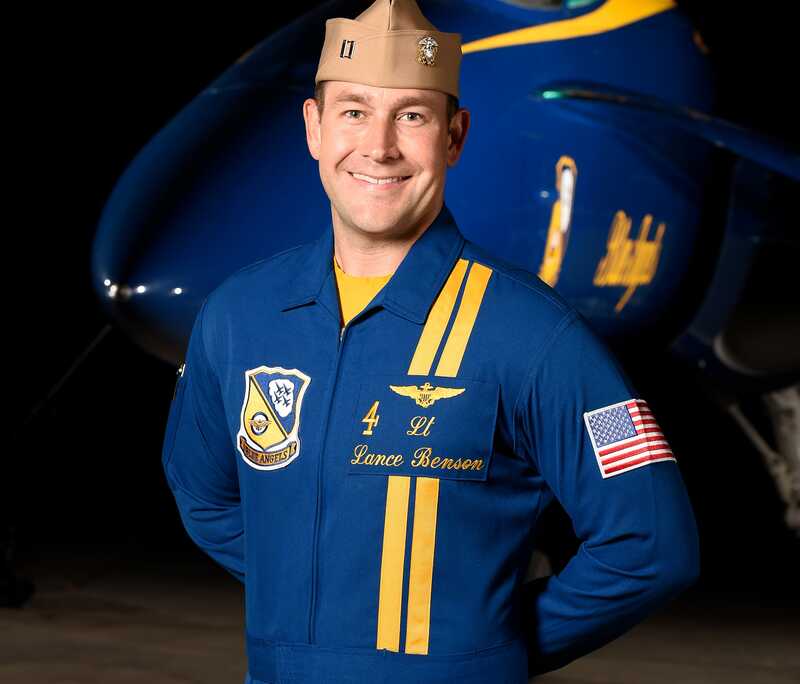 #4 Navy Lt. Lance Benson, slot. Benson is a native of McPherson, Kansas. He attended Kansas State University. 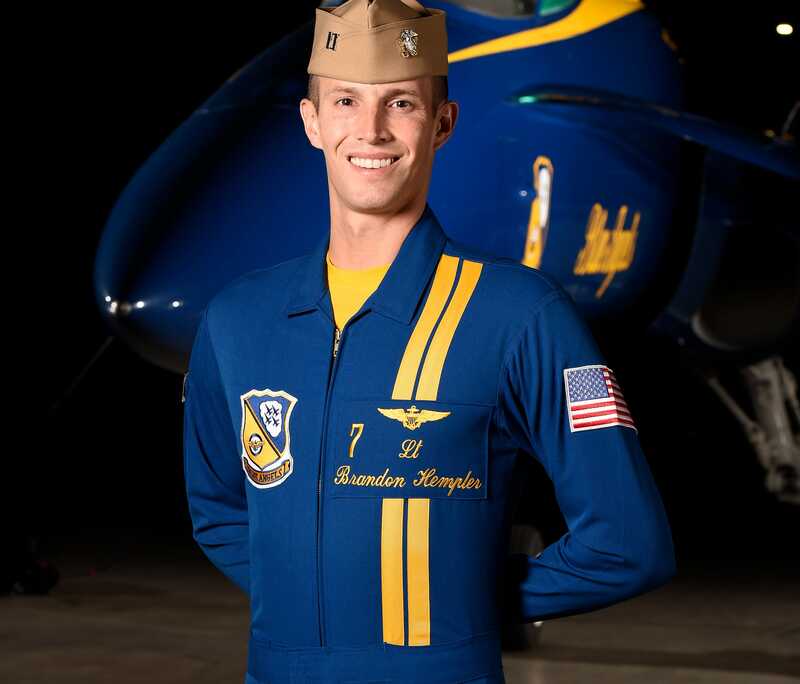 Before being selected for the Blue Angels in September of 2016, he was an instructor pilot at Naval Air Station Meridian, Mississipp. # 5 Navy Cmdr. Frank Weisser, lead solo. Weisser is a native of Atlanta. He graduated from the U.S. Naval Academy in Annapolis, Maryland. 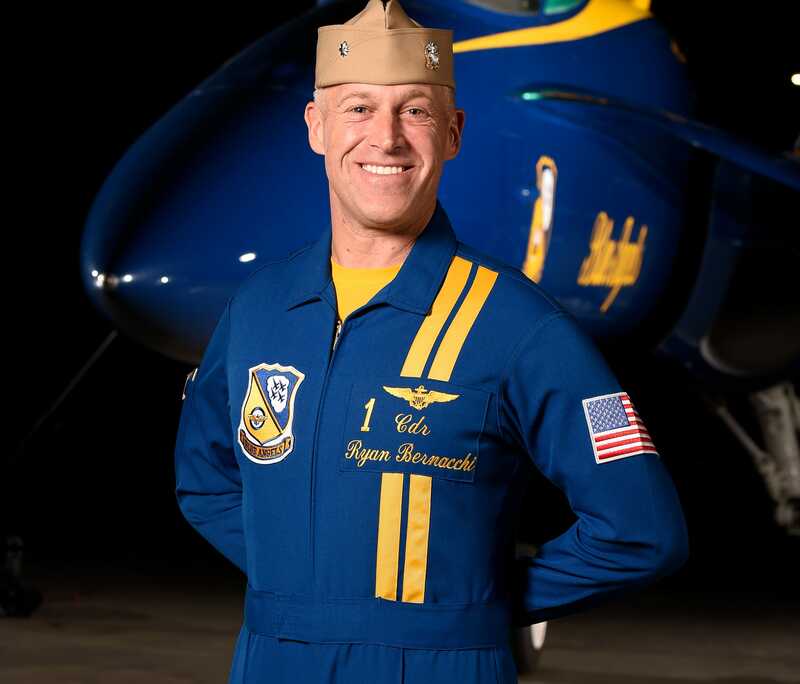 Weisser previously flew with the Blue Angels in 2008 through 2010 as both opposing solo and lead solo. 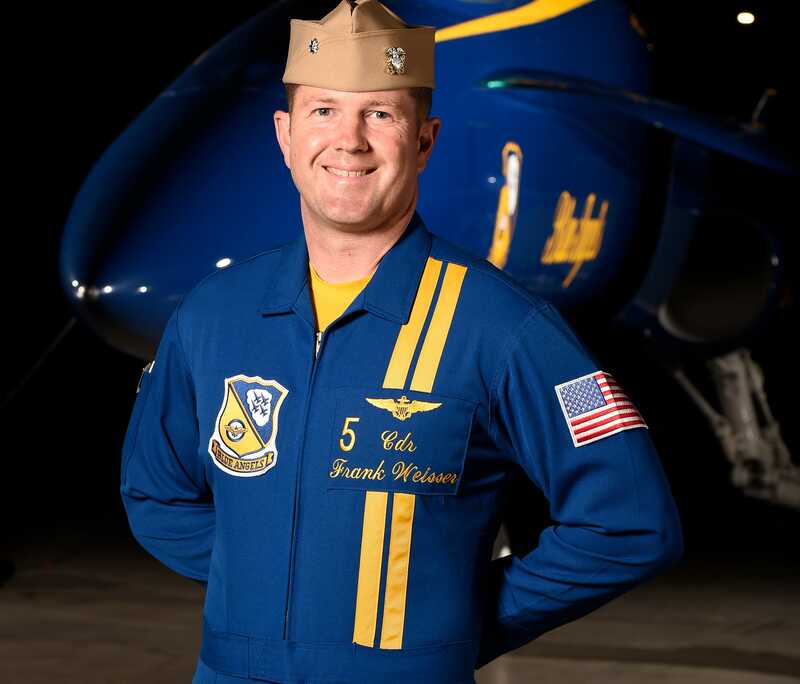 Weisser rejoined the team in 2016 after Blue Angels pilot and Marine Capt. Jeff Kuss died in a crash at a Smyrna, Tennessee, air show. Before his latest tour with the team, Weisser was supervising training at NATO School Oberammergau in Germany. #6 Navy Lt. Tyler Davies, opposing solo. Davies is a native of Kennesaw, Georgia. Davies enlisted in the Navy before attending University of La Verne in Riverside, California. 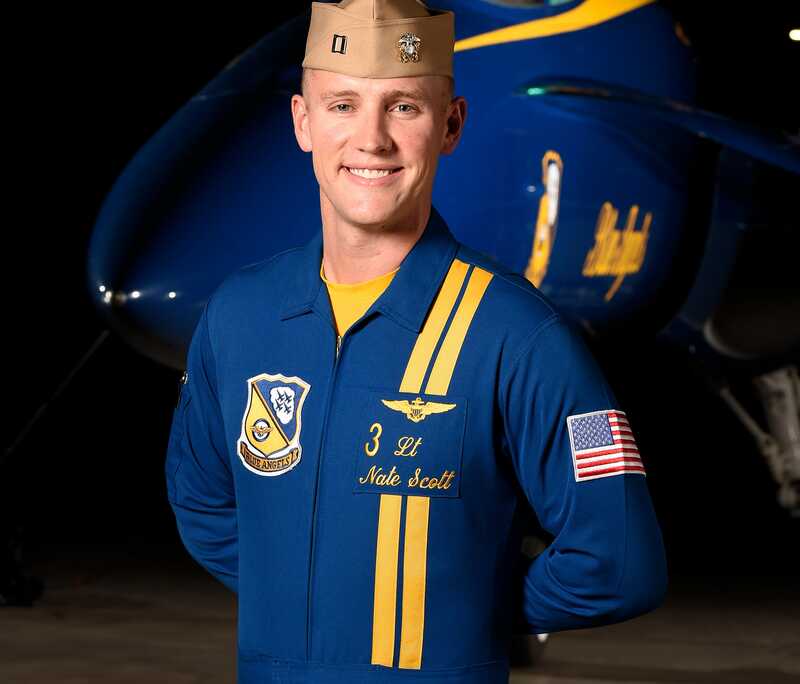 Before being selected for the Blue Angels in September of 2015, Davis served as an instructor pilot at Naval Air Station Oceana,Virginia. Davis was the team’s narrator during the 2016 show season. #7 Navy Lt. Brandon Hempler,, narrator. Hempler is a native of Warnego, Kansas. He attended Kansas State University. Before being selected for the Blue Angels in September of 2016, Hempler was deployed as part of a strike fighter squadron on board the USS George H.W. Bush.